If your business has a product or service to offer those in the quality assurance industry it can be difficult to know where to begin. One of the most important factors in any type of marketing campaign is to ensure that your messages are actually going to reach the right people; constantly coming up against gatekeepers or invalid contact details is not only frustrating but can also quickly become a big drain on your time and resources. This is why it is so imperative that your company is sure to get hold of accurate and high quality data; and in this guide we’ll tell you just how to go about doing this in order to really make the most of your campaigns. With reports suggesting that in the near future more than 40 percent of IT budgets will be committed to quality assurance and software testing, it is clearly a great time to target the industry for potentially lucrative deals. 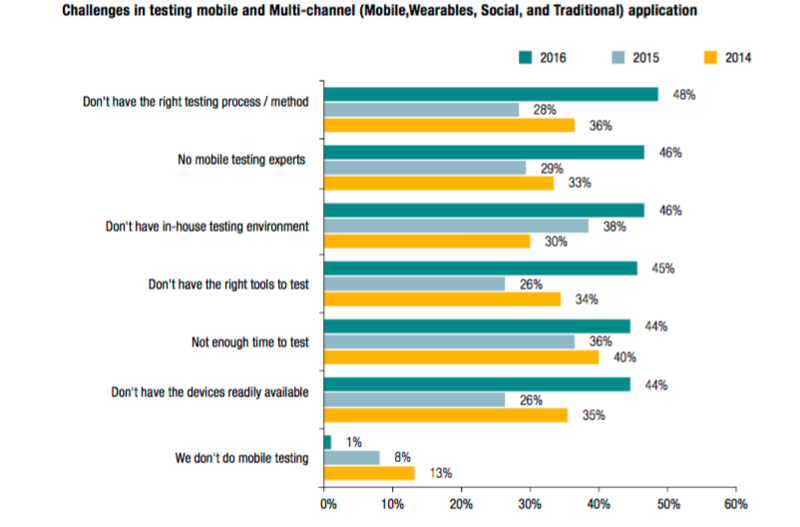 Mobile testing is one of the biggest priorities for many companies, and with coming up against challenges when setting this up in-house (see chart below), there are clearly a number of outsourcing opportunities in this area. Simply put, a list is just a company’s list of contact details of potential clients. Once you’ve built your list, you will be able to use it to send email campaigns much more quickly and efficiently, and you will also be able to group different contacts together in order to target them in different ways or for different products or services. For these reasons, your list will easily become your company’s best asset in terms of engaging with your customers and driving an increase in sales. Despite the rise of social media, when it comes to marketing email is very much still number one; it gets a return on investment of around 4300 percent according to the Direct Marketing Association, and a study by Forbes found that 20 percent of marketers can directly link their email operations to their company’s primary revenue source. By building your email list, you can quickly and easily target a large number of potential leads and create marketing campaigns that have the potential to bring in significant revenue. Contact your customers directly – Because your emails land directly into your leads’ inbox, you are not having to compete with the constant distractions of social media, that mean your posts can easily get lost in their news feed. It also means that your interactions are private, so if your contacts do want to hear more about what you are offering, they can do so and it will be much easier to build a strong relationship with them as well as keep track of your previous interactions. Segment your contacts – Being able to segment your contacts is huge advantage of email that you cannot get from any other kind of marketing interaction. Different demographics will obviously have different likes and needs, and by differentiating between them you can create targeted emails that are more likely to engage them. It also means that you can target only specific groups within your list, for example you can choose to market your new product to those who haven’t already bought it. You control it – Given that you own your email list, you also have complete control over it. The same obviously can’t be said for social media, which can be volatile to say the least, with different ratings and popularity policies meaning your posts may never even be seen by your followers. Customers prefer it – Finally, and perhaps more surprisingly, email marketing is actually seen as a positive thing by the majority of customers. A survey conducted by MarketingSherpa resulted in 72 percent of participants stating that they prefer to receive promotional content through email, compared to just 17 percent who prefer social media. When seeking out quality assurance professionals by means such as website sign ups and in-person interactions at events, it can quickly become a time-consuming process. Many experts suggest that around 1000 contacts is ideal for a successful marketing campaign, and realistically for small businesses this could take months. Thankfully, there is another option — Global Database we have over 5 million contacts across 195 countries, and our high data accuracy rate means you can build efficient lists from scratch without having to compromise on quality. What’s more, our database is fully searchable using a range of different filters, to ensure you can target exactly the right kinds of people for your business. Location – Are you just looking for quality assurance professionals in a certain country? Seniority level – In order to ensure that you are only reaching out to people who can actually make purchasing decisions, you need to narrow your search down to C-level professionals, Directors, VP, Managers, Heads of QA and Senior level QA executives. Employee size – Should you want to solely target QA executives that work in companies with less than 1000 employees, for example, you should use this filter. Sales Volumes – Obviously you want to make sure that your potential clients have the budget to buy your product or service, and filtering companies depending on their revenue is the perfect way to do so. Industry – Narrow your search down to industry sectors such as Telecoms, Banking, and HR. When your email list is ready to go, there are a number of different types of email you can use in order to create effective marketing campaigns. You could contact your list to let them know about a new product or service your business is offering, offer them a discount or free trial, invite them to an event your company is hosting or partaking in, or just update them on general news from your business. Bear in mind, though, that you don’t want to get into a habit of emailing too frequently; this will only make your contacts feel hassled and could cause you to be reported for spamming. At Global Database we recommend sending messages no more than once every two weeks; this is enough to keep your clients reminded of your business without being intrusive. In order to give your campaigns the best chance of success, it is generally advisable to use a professional email marketing service rather than a free one (such as Microsoft Outlook). There are several reasons for this; firstly, with most free services you will have a cap on the number of emails you can send in a day, and you also won’t have access to detailed metrics or be able to send segmented campaigns, which, as we discussed earlier, is an integral part of successful email marketing. When it comes to paid email platforms there are a number of affordable options to choose from, though at Global Database our experts recommend using either Sendgrid, Amazon SES or Sendinblue. Why? Simply because these all have high deliverability rates and offer good value for money. Be sure to carefully assess each one before you make your decision though, as they all have slightly different offerings. There are several other factors to consider when putting your email campaign together. One of the most vital components of all is the subject line; it needs to be intriguing enough to persuade busy contacts to click on it, and shouldn’t contain words such as ‘free’, ‘prize’ or ‘opportunity’ which can cause you to be identified as a spammer. Another of the most important factors of your campaign is ensuring that your content is interesting and valuable. Try including facts, charts, anecdotes and pictures in your messages; according to HubSpot, 65 percent of users prefer emails to contain mostly images, compared to 35 percent who prefer text. You should also always make sure you include a clear and persuasive call to action in your emails. It’s also worth noting that using a call to action button instead of a text link can significantly increase conversion rates, and emails with social sharing buttons see a 158 percent increase in click through rates, according to Nonprofit Hub. No matter how carefully you craft your email campaign, you will always have a certain level of unsubscribes; this is natural so don’t be disheartened. At Global Database we recommend sourcing new data after your first three email campaigns in order to keep your data as fresh as possible. Fortunately this is extremely easy to do once you have purchased access to our database, as we add new data every day. This means that you are able to regularly export new lists of professionals from the database, for free and with no limits. We also validate every email address on a 30 day basis, resulting in an accuracy rate of 93 percent – one of the highest in the industry.